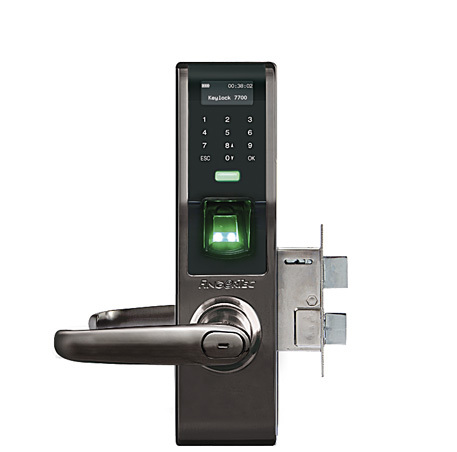 Keylock 7700 supports a few verification methods, such as fingerprint, 6-digit password, and even card verification. Choices, choices. The smooth zinc alloy finish combined with a classic black touch screen gives the device a polished look suitable for any professional workplace or SME. Keylock 7700 is installed on a door itself, saving wall space and efforts of wall-hacking for installation. Expecting some unregistered guests? No problem. Keylock 7700 only locks when you raise the inner bar latch a little upwards. So you can be in control of when your door is locked and unlocked. Keylock 7700 functions on battery power, and the device itself is programmed to optimize the life of the inserted batteries by going into power save mode when left idle for too long. Keylock 7700 contains a large memory capacity of 32MB, more than enough to hold the 500 fingerprint and 500 passwords enrolled, as well as transaction logs and time zone settings. With the USB management style of Keylock 7700, data transfer couldn’t get easier. Downloading transaction logs is now a matter of a few steps. Nothing but the best is used for the Keylock 7700, which is why it supports the latest VX10.0 algorithm for a faster, and more accurate fingerprint scanning.